The idea of cloud computing aligns with new dimension emerging in service-oriented infrastructure where service provider does not own physical infrastructure but instead outsources to dedicated infrastructure providers. Cloud computing has now become a new computing paradigm as it can provide scalable IT infrastructure, QoS-assured services, and customizable computing environment. However, it still remains a challenging task to provide QoS assured services to serve customers with minimized cost, while also to guarantee the maximization of the business objectives (e.g. margin profit) to service provider and infrastructure provider within certain constraints. In order to address these issues, this chapter proposes a QoS-oriented service computing methodology, and discusses associated topics including service level agreement and associated reference architecture, green service, service metering and metrics, service monitoring, and on-demand resource provisioning. In the case study, we demonstrate how we employ QoS-oriented service computing in a multi-server, multi-user on-line game to facilitate the on-demand resource provisioning to maintain quality of service and quality of experience. Service computing is a multi-discipline domain that covers the science and technology of bridging the gap between Business Services and IT Services (Zhang et al., 2007). It aims to enable IT services and computing technology to carry out business services more efficiently and effectively. The supporting technology suite includes Web services and service-oriented architecture (SOA), and business process integration and management, etc. Although service computing is business-oriented, it has also been proved to be an effective approach that can be employed in e-Science to develop modern cyberinfrastructure to facilitate the scientific research and discovery. 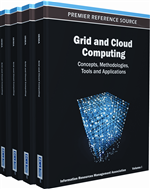 More recently, the emergence of Cloud computing has brought new dimensions of applying IT and computing technologies to businesses and scientific research, which results in a new computing paradigm, where service provider dose not have to own any physical infrastructure but instead outsource to dedicated infrastructure providers. This computing paradigm can provide a scalable IT infrastructure, QoS-assured services and customizable computing environment. However, the current service computing technologies can not always meet the requirements of this computing paradigm, and there are several issues arose: (i) QoS-assured service delivery: while relationship between customer and service provider is inherently a “Customer – Service Provider” relationship, the service provider and infrastructure provider have also established a “Customer - Service Provider” relationship. As in this model the service provider faces both customer side and infrastructure provider side, the guarantee of the delivery of QoS-assured service becomes increasingly critical. (ii) Green service. How to provide QoS assured service to serve customers with minimized resource consumption cost and meet customer’s satisfaction, while also to guarantee the maximization of the business objectives (e.g. margin profit) to service provider and infrastructure provider within certain constraints. (iii) Service discovery: One service can have several service providers with different service prices. Even the same service provider can provide a service with different Service Level Objectives (SLO) which incurs different cost. How customers can find appropriate services they want. (iv) Service metering, which plays a fundamental role in service computing as QoS-assured service and green service all require metered services to be delivered. This involves creating a generic metric model which can be used in different service occasions. (v) On-demand resource provisioning. How to elastically provision resources on-demand? Currently, service computing / service engineering mainly concerns about the service modeling, creation, deployment and service quality assessment during its lifecycle, known as Methodology of Service Engineering (MSE). For example, the discipline of service engineering, which was first proposed in the mid 90’s in Germany and Israel (Bullinger, 2003; Mandelbaum, 1998), is concerned with the systematic development of services using suitable models, methods and tools. Service engineering promotes an integrated service by adopting technological methods and employing existing engineering know-how to maximize efficiency (Tomiyama, 2001; Bullinger et al., 2003). Product service co-design and service modeling claim that traditional engineering methods and tools in applied science can be borrowed for service design and development (Ganz et al., 2004). Service CAD argues that computer-based tools can be used to design services, just as CAD can be used to facilitate the design of products and simulation of their behaviors under various circumstances (Tomiyama, 2003). The driver for the emergence of New Service Development (NSD) is that the product development paradigm fails to address the unique characteristics inherent in services, such as customers as a participant in the service process, intangibility, and heterogeneity of customer demand (Fitzsimmons et al., 2000). Life cycle oriented service design (Aurich et al., 2004) argued that Life Cycle Engineering (LCE) (Jeswiet, 2003) can be adopted for the design of service. However, these static service computing technologies mainly concern the modeling, creation and deployment of separate services. They can not well resolve issues occurring at the stage of service discovery, service outsourcing, and service usage. In order to address these issues in service computing, we proposed “QoS-oriented Service Computing” to accommodate needs for service computing in the context of Cloud environment.